The RTC secures and funds a variety of pedestrian projects, including expansion and improvement of the local sidewalk network, accessible pedestrian facilities services, and safe paths of travel to connect to transit. The duties of the Elderly & Disabled Transportation Advisory Committee (E&D TAC) include reviewing and advising local jurisdictions and implementing agencies on pedestrian accessibility projects. In addition, there is a subcommittee of the E&D TAC focused specifically on pedestrian issues. The mission of the Pedestrian Safety Work Group (PSWG) – a subcommittee of the E&D TAC (see above) – is to ensure safe and accessible pedestrian travel and access throughout the county for the benefit of all residents. More information about the group can be found in the PSWG page. Notice obstacles or hazards that may inhibit bike or pedestrian travel? Let us know by submitting a Hazard Report. 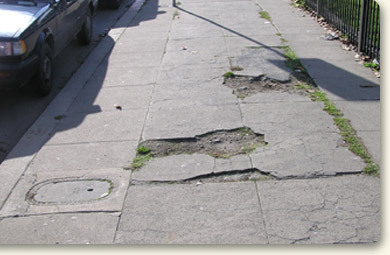 Access issues can include damage to or missing sidewalks and/or vegetation or other objects blocking the walkway. Reports are forwarded to the appropriate jurisdiction for investigation and action.